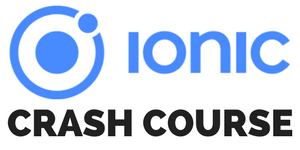 We are already at the second part where we will develop the actual Ionic app. Inside the first part we have built the server for our JSON Web Token authentication so make sure you got that server up and running by now! Once we are done with this part you have a fully working authentication system working where users can signup, register and login to pages that only logged in users can see! Once your app is ready we need to configure our JWT package for our module: We need to let it know where our access token is stored and also since a later version we have to supply an array of whitelistedDomains inside the jwtOptionsFactory. The trick is: For the domains listed in that array the package will automatically add the “Authorization: Bearer xyz” header with our token to every request of the Angular HttpClient! In our case the server should run exactly there, it’s also the whitelisted domain we passed to the JWT helper. If you have deployed the server or run it on a different port make sure to change those values. To get the current value of our authentication state we can call the isAuthenticated function. Subjects are pretty cool! It’s not yet enough because if you want to make your app more secure you have to prevent access to certain pages if the users are not logged in. To do so we have already created a new Route Guard with the CLI in the beginning in which we can implement the canActivate function. Because we use Ionic 4 we have to talk about routing. To navigate through our app we have to define the different paths and components for them and also we want to apply the guard from before to the inside page of course. Now our inside route is protected using the guard and whenever a user tries to navigate to that URL, the check will be called and access is prevented if he’s not authenticated! This is a basic example, and you can also find examples for creating a tab bar or building a side menu on the Ionic Academy for free! To make everything a bit more comfortable for the user we can subscribe to the authentication state at the top level of our app so we immediately notice any changes and react accordingly. Alright, all services and logic is in place, now we just need to implement the 2 pages of our app and we are done! Inside our page we define our form to consist of the email and password, exactly what our server from the first part expects! Because we have implemented the important functionality in our service the onSubmit function that is called for the login only needs to call our service and wait. Remember, inside the service we sate the state after a successful login, and our app component at the top will notice the change and perform the needed routing for us! Same counts for the register function but here we can also automatically call the login so when the user registers he will also be logged in directly afterwards which is quite common these days. Our view is not really spectacular, we simply need to wire up our input fields with the appropriate names from our reactive form and add a check to our buttons if the form values are actually all valid. The rules for this check have been added to the form in the step before! Also, if you want to have another button inside your form that will not trigger the form action, simply add type="button" to have a standard button with it’s own click handler. Alright, now you can already fire up your app and see the login but we need one more thing. To see if our whole authentication system actually works we need a page that is only available to users that are logged in. On this inside page we only perform some dummy operations but they’ll help us to further understand the JWT auth concept. So our page can load the special information (adding auth headers is handled by the service/package automatically) that we have defined inside our server as a route that can only be accessed with a valid token. Of course the last function is not needed for our auth system, it just shows: Once we clear the token from the storage we are still on the same page, but when we make the next request (here loading the special info again) we receive an error back from the server and because it means we are not authenticated, our service in the background will clear the token and throw us back to the login page! That’s it for the Ionic JWT app and authentication system! It doesn’t really matter in which language your server is written if the system uses JWT auth, you can very easily build an Ionic app that works with it without any problems. Of course this tutorial only shows one way to achieve the desired results, there might be many more different solutions but the concept of the JWT auth will be pretty much the same across all of them. If you enjoyed the series, leave a comment and don’t forget to share it on your preferred social media.